Blue Stocking Bee Balm is a traditional favorite for the perennial garden. It has fragrant gray-green foliage and a beautiful display of rich, bright violet-blue flowers during the summer. It makes an excellent cut flower. It will grow to a height of 30" to 40" and 24" to 30" wide. Water regularly during the summer to prevent powdery mildew. Deadhead to increase blooming time. Blue Stocking Bee Balm likes to be planted in full sun to partial sun. Use this plant in a perennial border, cottage garden, or as a grouping in a landscape bed. Blue Stocking Bee Balm attracts butterflies, bees, and hummingbirds. You can even eat the flowers. Bee Balm will spread quickly, so reduce the clump size in early spring. 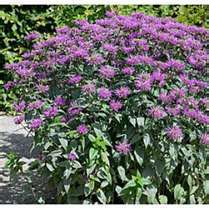 Blue Stocking Bee Balm is deer resistant and drought tolerant once it is established. It is a Firewise plant and will tolerate wet soil making it a good choice for next to streams, ponds, or wet areas.